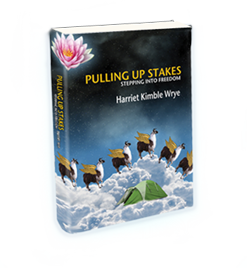 Pulling Up Stakes: Stepping Into Freedom explores the outer terrain of Wrye’s travels with her husband in Africa, West Papua, Asia, South America, and the Sierra High Country and delves into the inner terrain of her psyche, their marriage, and her spiritual yearnings. Any reader who has a long-held dream to become a citizen of the world will be inspired by Wrye’s determination and courage to make her own dreams come true. A fascinating read.